Guests have lined the parade route. 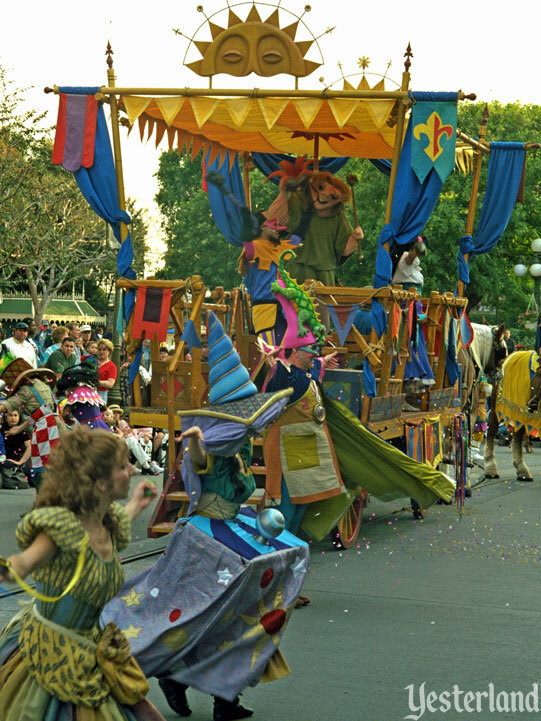 Floats with characters from The Hunchback of Notre Dame emerge from backstage. And parade music fills the air. Only this isn’t really a parade, in the traditional sense. 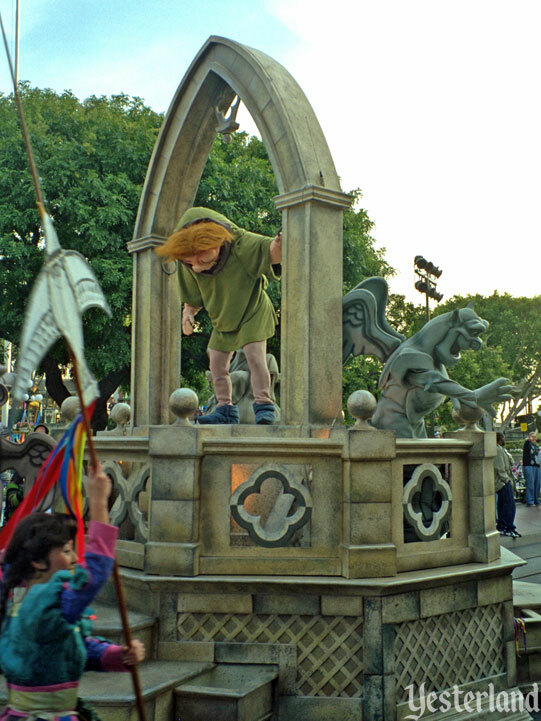 The Hunchback of Notre Dame Procession is a procession. Procession means people or vehicles moving forward in an orderly fashion, often as part of ceremony. In a slightly earlier incarnation, it was The Hunchback of Notre Dame Topsy-Turvy Cavalcade. Cavalcade means a formal procession. You could just call it a micro-parade, because it’s so short. Or a traveling street show, because it periodically stops for a dance performance. By the way, do you know what strumpets (in the song) are? They’re not something you expect in an animated Disney feature. But the word rhymes nicely with trumpets. This procession has exactly two floats and three horses. Phoebus is riding one horse. The other two horses are pulling one of the floats. 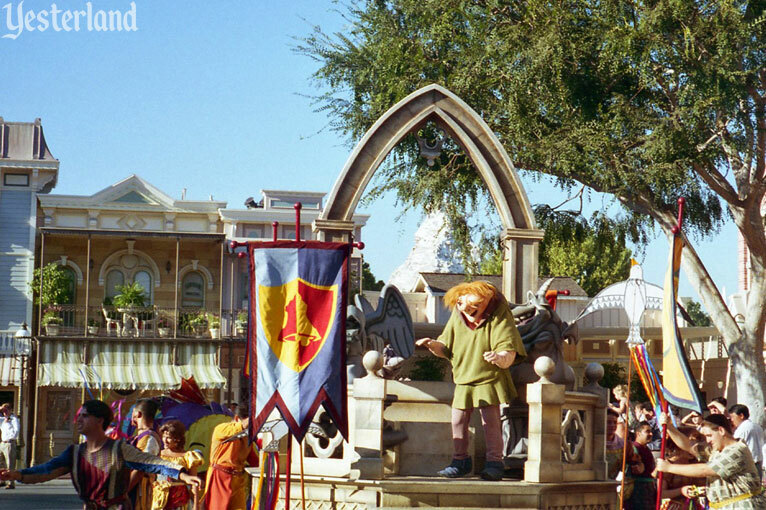 In addition to Phoebus, the procession includes Clopin, Quasimodo, Esmeralda, Claude Frollo, along with at least two of Quasimodo’s three gargoyles—Victor, Hugo, and Laverne. It’s all over. Nobody promised you a long parade. Do you want to see it again? It starts again just 75 minutes after its previous start, but from “it’s a small world” instead of Town Square. 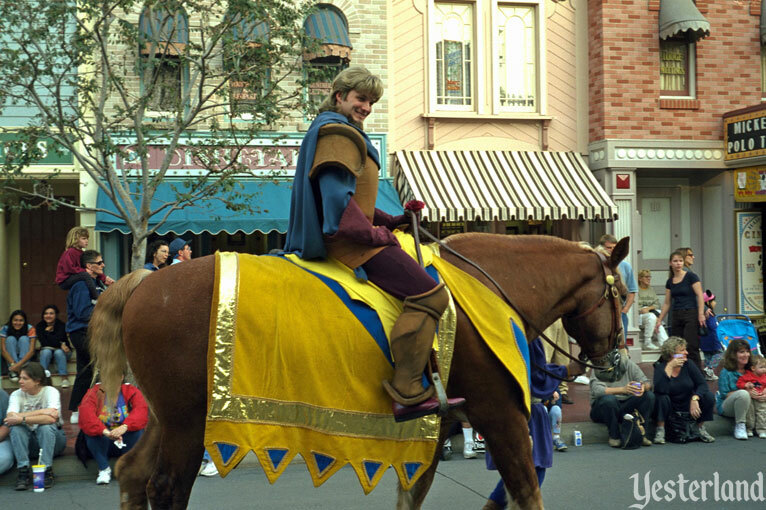 Phoebus riding south on Yester Main Street, U.S.A.
That was it. You’ve now seen the procession twice—once in each direction. 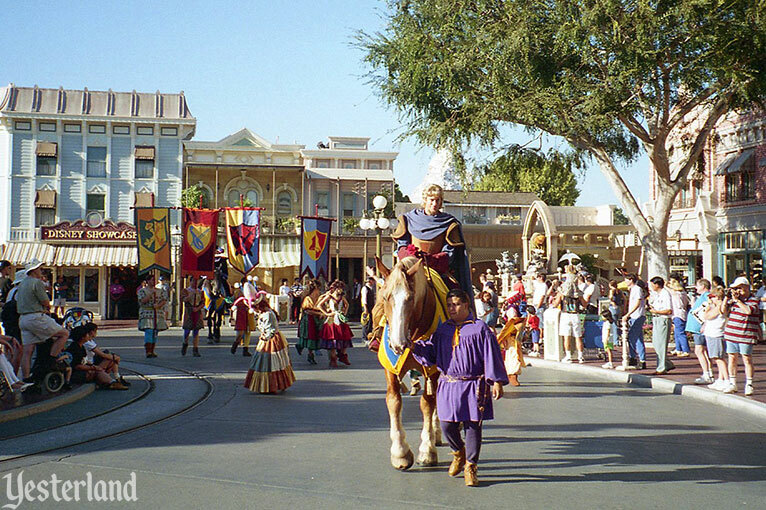 Compared to traditional Disneyland parades, The Hunchback of Notre Dame Procession required few Cast Members. It would run on particularly slow days—such as Monday through Friday in late January 1998. 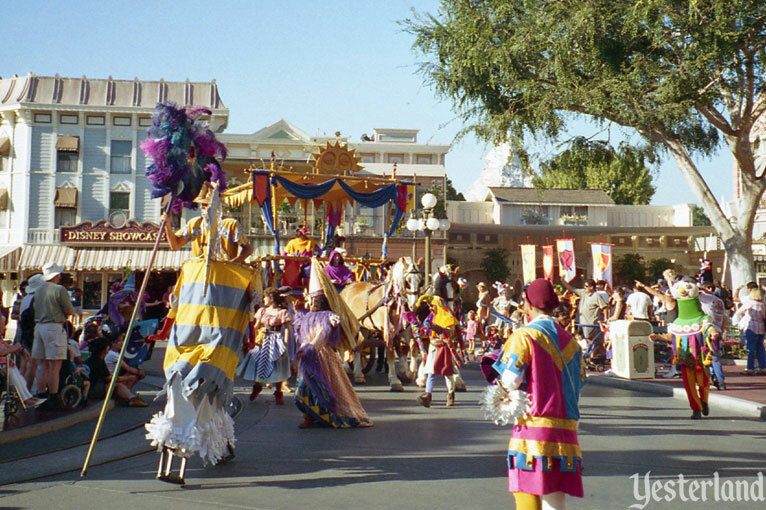 On weekends and other busier days, Hercules Victory Parade would be on the parade route, and Hunchback of Notre Dame Festival of Fools would perform in a medieval setting in Frontierland. 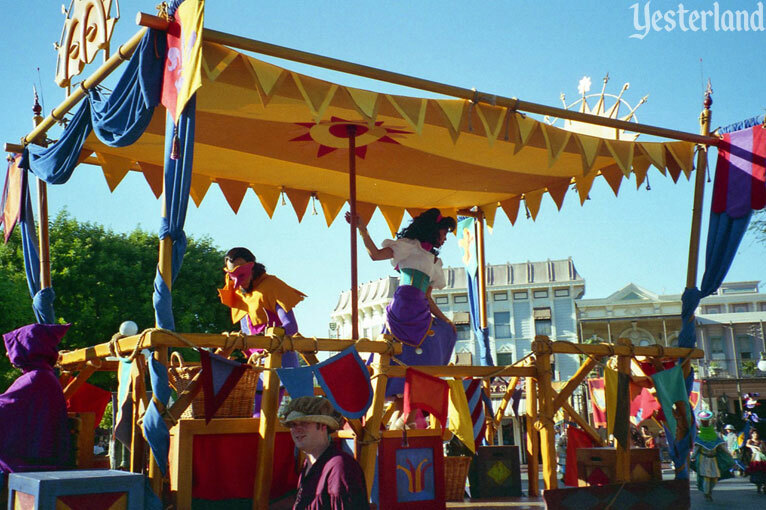 This allowed Disneyland management to control costs, while still giving guests something to watch on the parade route.